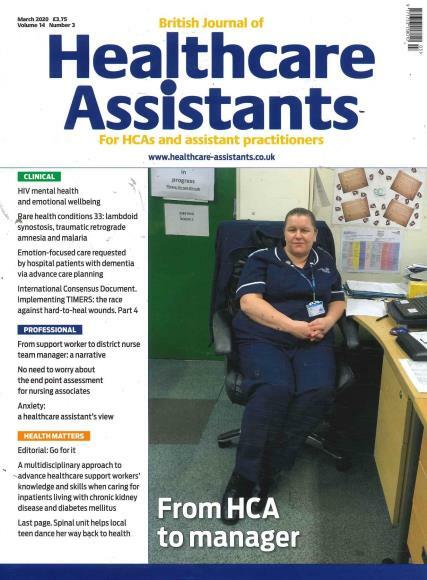 British Journal of Healthcare Assistants is the only monthly, peer-reviewed journal to recognise the importance and potential of the million-strong group of healthcare support. Buy a single copy or subscription to British Journal of Healthcare Assistants magazine. Each issue contains a range of evidence-based articles providing positive examples of good practice in areas as diverse as infection prevention, phlebology, continence and nutrition support. The maazine highlights learning outcomes to support practitioners' on-going training and to help extend their knowledge and skills in practice. The journal also highlights the diversity of career paths available to HCAs, and provides analysis of the impact of changing policy on this important groups of health workers. It has a lot of information for Healthcare Assistant.